The High Point 911 Facebook page posted photos of the building at 2422 W. English Road. GREENSBORO, NC (WFMY) – Heavy snow is causing problems across the Piedmont Triad in the midst of one of the biggest December snowstorms the area has ever seen. The weight of the snow is becoming just too much for some buildings in the area. In Winston-Salem a building collapsed on Waughtown Street near Marble and Pleasant Streets. The Fire Department said the building was very old. No one was indie the building when it collapsed. The debris resulted in closing part of Waughtown Street between Marble and Pleasant Streets for a few hours to clear the roadways. In High Point, a vacant building collapsed on West English Road. The building collapsed Sunday night. The scene in High Point where a roof collapsed at a vacant building. 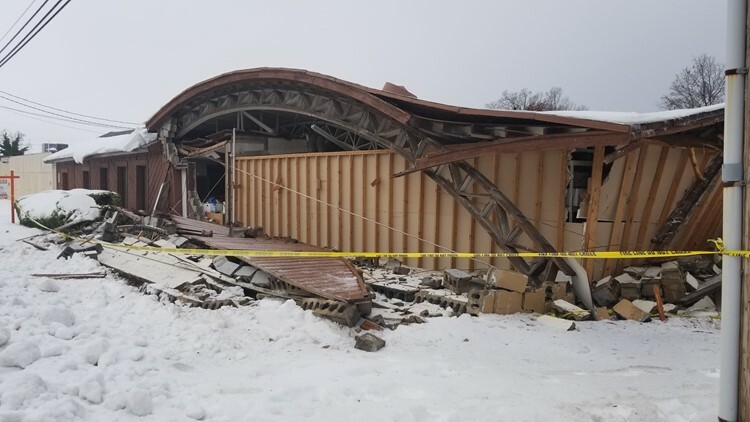 In Morganton, heavy snow caused an awning to collapse at a gas station.